All towboats in N and Z scale are built in the same manner. Some may have cast resin hulls, which will eliminate the first steps. The 145′ towboat main cabin follows the hull contour, so is best built upside down–i.e., the top is flat. All others can be built right side up. There are five longitudinal hull stringers, plus two taller stringers for the outside edges. 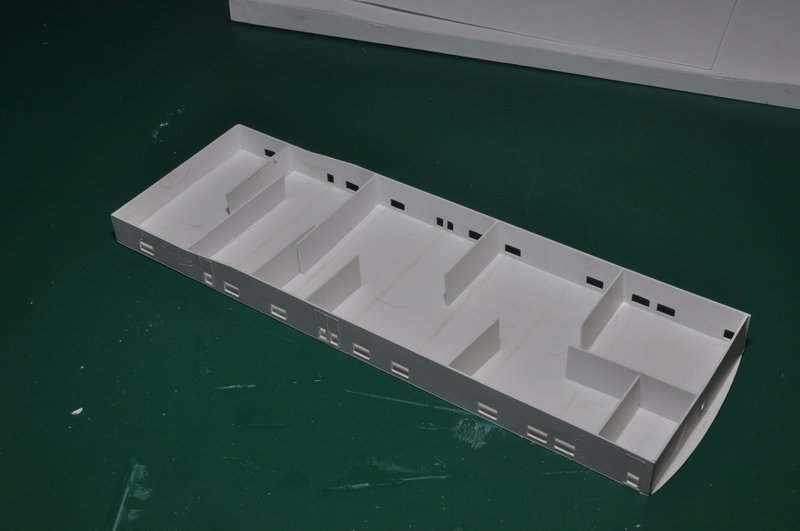 The exterior cabin walls are 16 mm high in N (11.6 mm in Z) ; interior braces are 15 mm in N (10.6 mm in Z). On the 145′ towboat the rear main cabin wall and interior braces are less tall, to follow the contour of the rear hull. 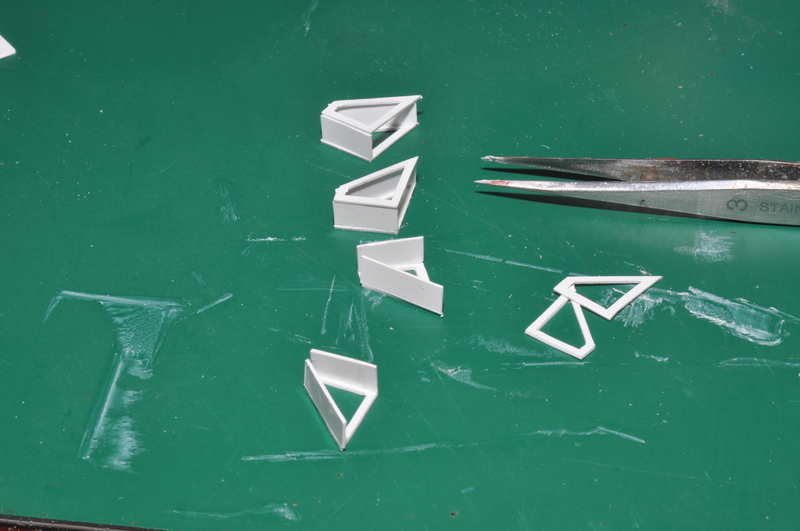 Some parts are doubled to provide better gluing surfaces, or smoother top finishes. If two part are of similar size, but one is 1 mm larger all around, they are usually meant to be laminated together, on center. 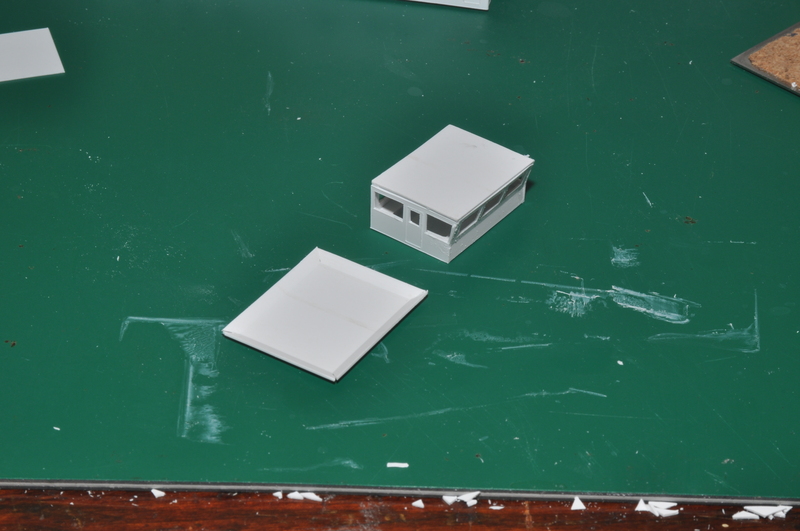 The smaller piece fits inside the walls; the larger piece covers the edges. The assembly makes for a strong joint. The 145′ Towboat is illustrated; the 110′ and 80′ are built the same way. Laminate two bases together, then glue the stringers as shown below. 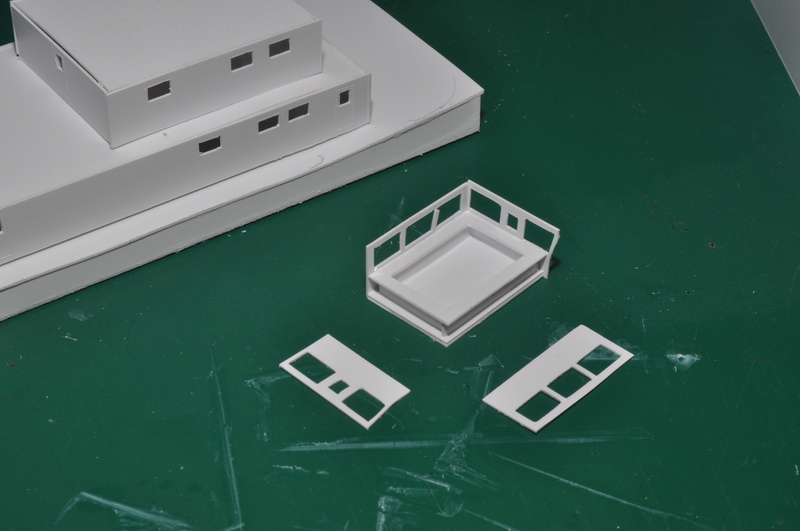 Lay out the roof of the 145′ towboat main cabin and the four walls, along with the interior bracing. Glue the ends to the roof, so that roof is inside the walls. Images on this site will helpt you identify front and back walls, and the orientation of the side walls. Note below that the 145′ has a curved overhanging deck–the 110′ and 80′ do not. The front wall has been cut so that it glues to the roof as shown. Also note the interior bracing. I install just enough bracing to block some of the cabin from being completely see through. 145′ towboat only: The cabin below follows the hull contour; it does not on the 110′ and 80′ ships. This requires additional bracing at the breaks in line at the stern. 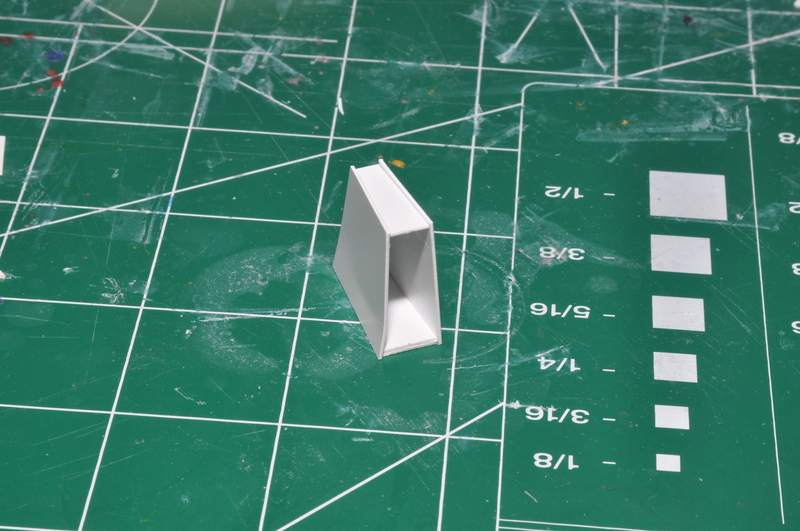 There is a strip of the correct height on the sheet (It.s is 0.5 mm less tall than the rear wall. Glue the floor to the assembly, making sure it follows the contours. 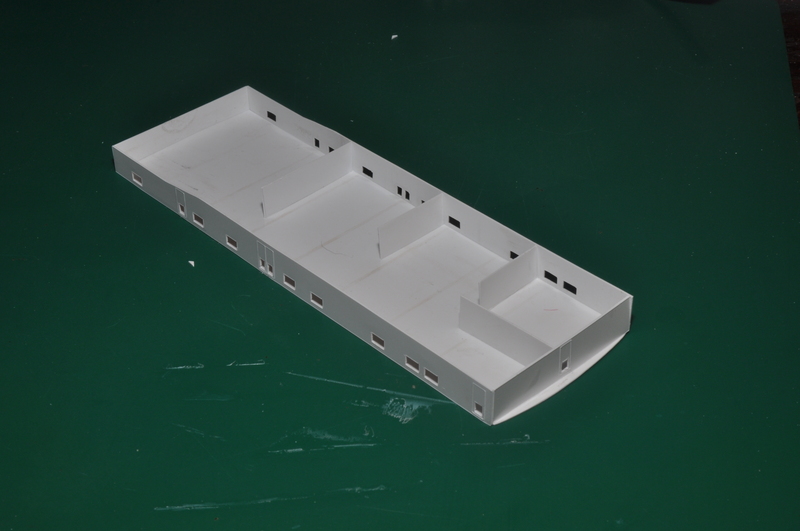 Test fit the main cabin to the hull. You may want to paint the decks and walls before gluing together. Note: the 80′ towboat has a second lamination of the roof that prodives a deck to the top of the push towers. 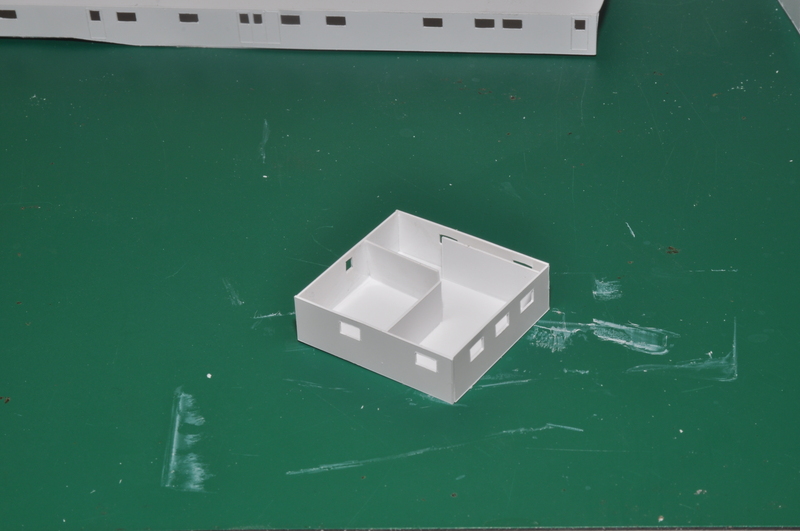 Assemble the second level cabin, ends first, then sides that clip the ends. Install interior bracing as desired. Glue on the roof. Assemble the pilot house. Notice the narrow strips that support the interior desk level. 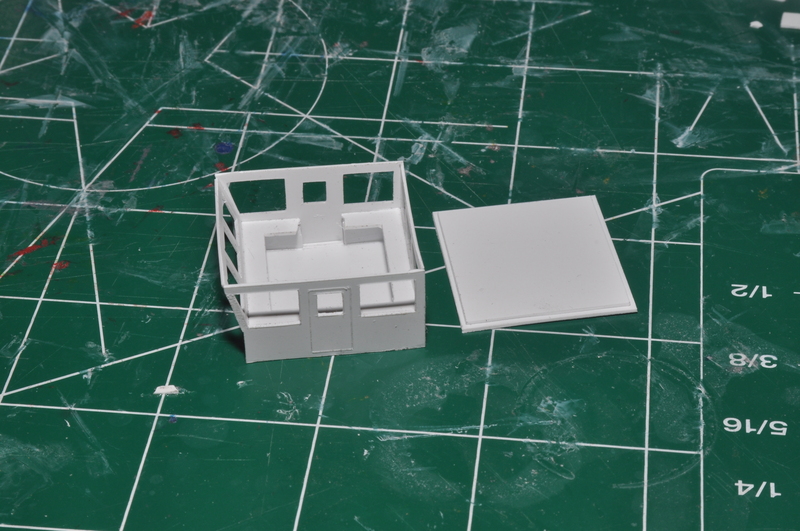 Here I’ve glued the rear and one side to the floor and desk level. 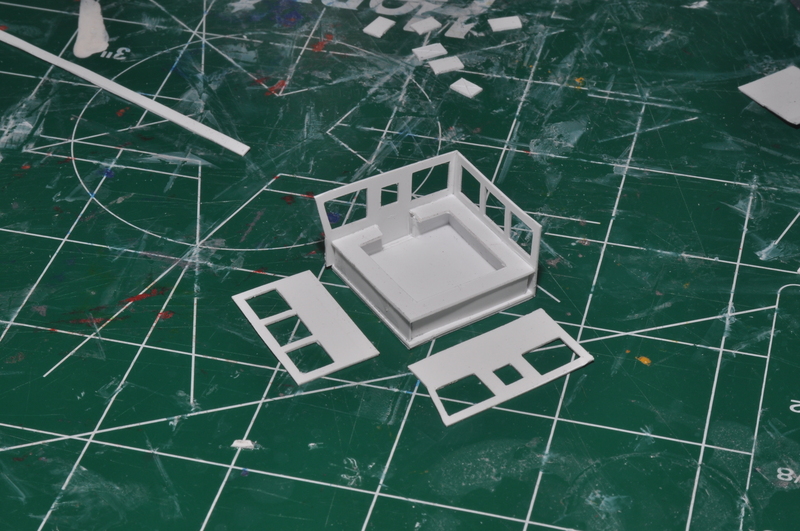 Once set, I cut out the desk level for the doors as shown below. This is a good time to paint the interior and add details if desired. The roof is two plies, one just inside the other, and should glue to the walls. Bend the edges of the sunshade up as shown below. You may want to fill the seams at the corners with putty. Assemble the five pieces of each push tower (four or two depending on size. 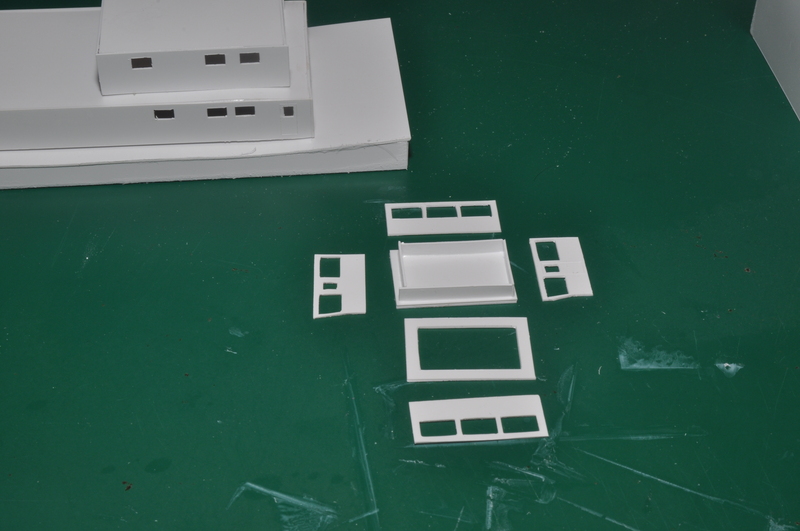 The outside of the outside braces will be aligned with the outside of the main cabin when installed. Assemble the six pieces of the stacks if cast resin stacks are not provided. 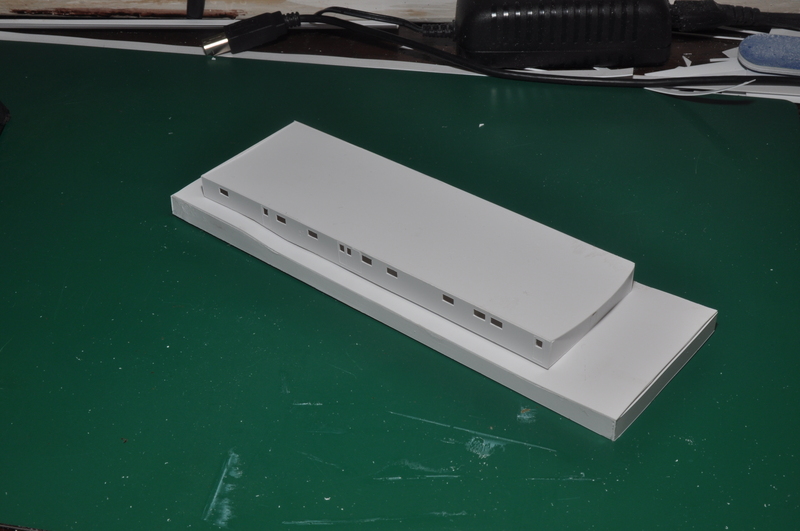 I installed 2mm wide strips (1.4 mm in Z) around the edges of the hull and painted them safety yellow. 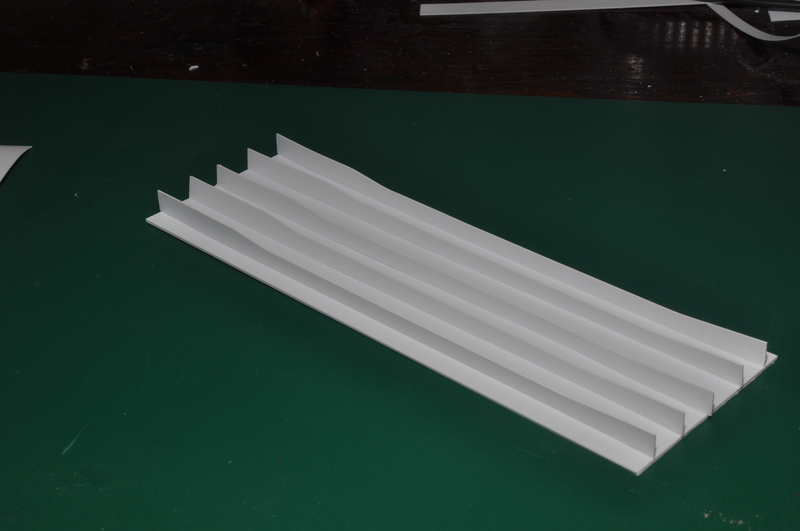 Cut a small length of railing lengthwise in half for the pilot house roof guard. 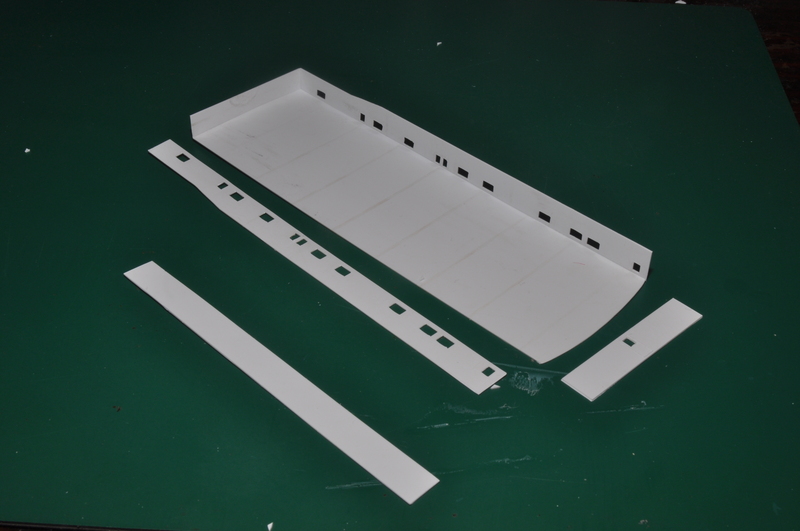 Masts, radars, boat cranes are laminated from two pieces; extras may be provided on the sheet. The exact location of some details is not standardized: refer to photos on this site or images of real ships for ideas. Just contact me. 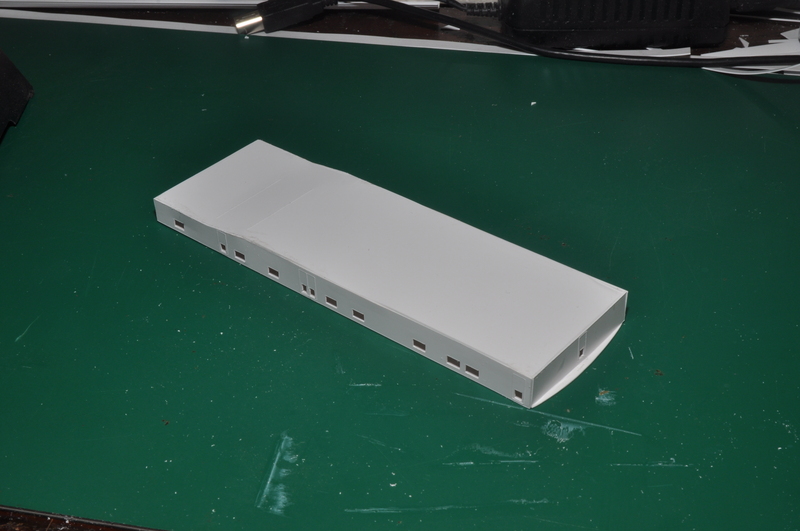 I supply most small styrene or cast resin replacement parts free of charge in the U.S. and for postage costs internationally. Brass railings and stairways are subject to a small charge, as they are expensive for me.